Never Forgotten Honor Flight receives no government funding and depends entirely on the generous donations of people like you. Donations are tax deductible to the fullest extent of the law. Make your checks out to: Never Forgotten Honor Flight and mail to: 4404 Rib Mountain Drive #234, Wausau, WI 54401. $500 fully funds one veteran to go on his/her “trip of a lifetime”! To donate using a credit card click HERE to donate to the Never Forgotten Honor Flight Fund at Community Foundation of North Central Wisconsin. If you make a donation to Honor a special veteran in your life; that veteran’s name will be added to “Our Honor Wall” Page. Any cards or letters sent with these donations will also be put on the Past Flights‘ page nearest the date of the correspondence. 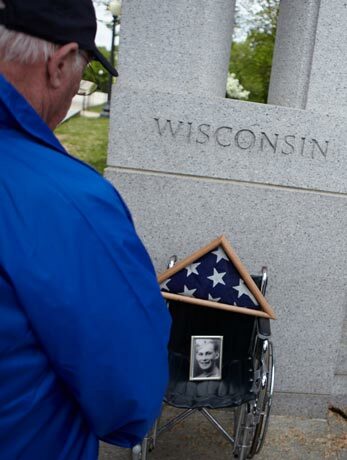 If you would like to donate to other Honor Flights that Fly Wisconsin Veterans, please go to our “Contact Us” page for links to their web sites. All donations are appreciated, however, we do not accept donations from WWII, Korea or Vietnam Era veterans until AFTER they have flown on an Honor Flight!. We can also accept donations through a secure online service, which is available here. 501c3 Approval Letter for Never Forgotten Honor Flight, Inc.